At PCA, students can gain a complete music education through participating in the wide range of opportunities. Students can take private lessons in piano, brass, woodwind, percussion, strings, harp, and voice. Faculty are well-qualified and hold memberships in several reputable music associations including Music Teachers National Association, Pensacola Music Teachers Association, American College of Musicians, and Florida Music Educators Association. Two elementary choirs, a junior high choir, and a high school choir allow students to develop their singing skills as well as their appreciation for music. Students work together as a team to prepare a mixture of patriotic, sacred, and fun songs to perform throughout the year. 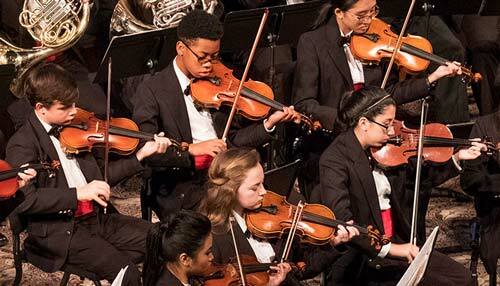 PCA offers four different bands for students of different ages and musical abilities. Musical selections highlight the strengths of each band, allowing students to quickly experience the joy of performing music together in a group setting. As early as grade 4, students can select a stringed instrument (violin, viola, cello, or bass), as they begin the Jaffé Strings Program. Beginning students do not need to own an instrument or practice outside of school. As they grow in their abilities, students can take private lessons or join an advanced orchestra. PCA's 16 lever harps enable students to master this beautiful classical instrument in a small group setting. After their initial introduction to the instrument, many students choose to further their instruction with private lessons.